The first step is creating the Táve calendar feeds you’d like to use. You can create a number of different feeds based on your needs. For example, if you have multiple employees in your studio you can create a feed that will show only events that the individual employee is an attendee on. If you’d like to give someone a more private feed of just your availability shown as simply “busy” or “free”, you can do that too. You can create these feeds in Settings › Data › Calendar Feeds by clicking on the New Calendar Feed button as shown below. After selecting the “New Calendar Feed” option, you’ll select the kind of events you want published in this feed. All events, availability (busy/free), only confirmed events and only tentative events are your 4 options. Next, you’ll select the users you would like to filter the feed for. This will determine whose assigned events you’ll see (they must be an event attendee as shown below). The last option is to restrict the feed to show only the past 3 months of history, as opposed to the default showing the entire history of events, if you prefer this option. Once you’ve saved the new calendar feed, you’ll see a URL created (as seen in the top screenshot above). These URL’s are what we will need later to setup the feed subscription in iOS. Once you pick the appropriate one you want to subscribe to, the quickest way to subscribe on an iPhone or iPad is to simply copy that URL and send yourself an email (assuming you have email setup on your device). This saves you the time and frustration of trying to retype that long URL by hand. Once you have emailed yourself the URL to your Táve calendar feed, pick up your iPhone and bring up that email. You'll copy that URL with your iPhone. 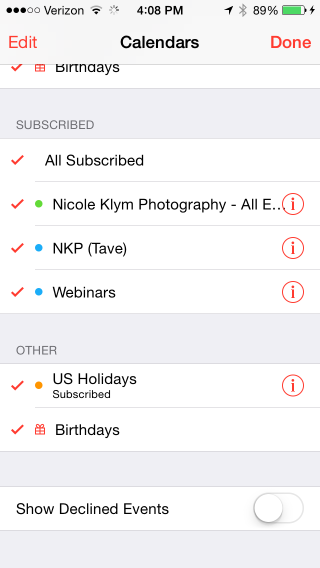 After successfully adding your Táve calendar feed subscription to your iPhone, you can customize it. 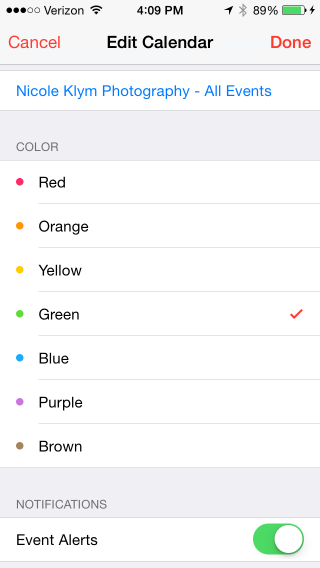 When in your iPhone calendars app, you can see your list of available calendars to show by tapping on the red Calendars link at the bottom of your iPhone’s screen. If you scroll down to your subscribed calendars you’ll see your newly added Táve calendar there. By tapping the little “i” button to the right of the calendar feed you’ll see the screen where you can rename the calendar, choose a different event color, and also opt into Event Alerts (turned on by default). You’re good to go!